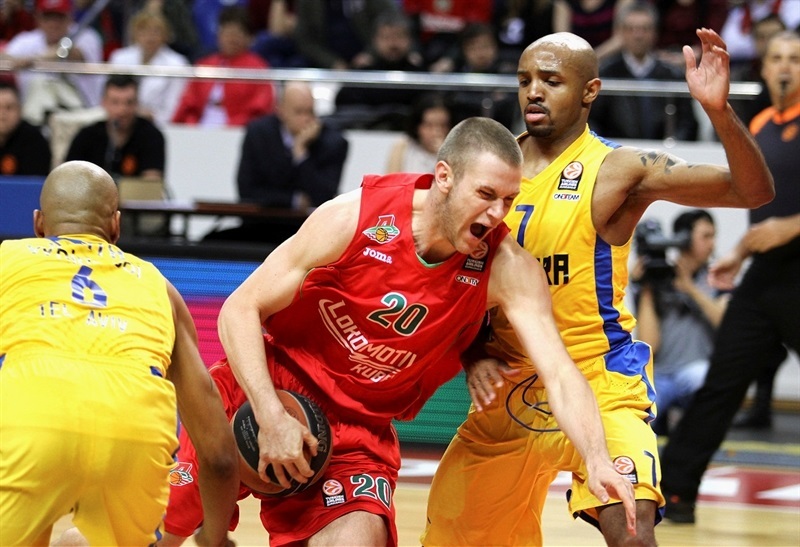 Lokomotiv Kuban snapped a three-game losing streak with a tough 78-76 victory over Maccabi Electra Tel Aviv on Friday. 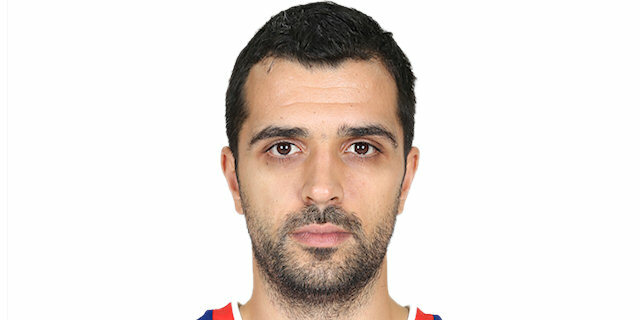 Krunoslav Simon scored 15 of his 23 points in the fourth quarter to lead Lokomotiv, which improved to 4-5 in the Top 16 and grabbed a share of fourth place in Group F alongside Bayern Munich. It was also the first win for Coach Evgeny Pashutin’s men against Maccabi in four meetings this season. 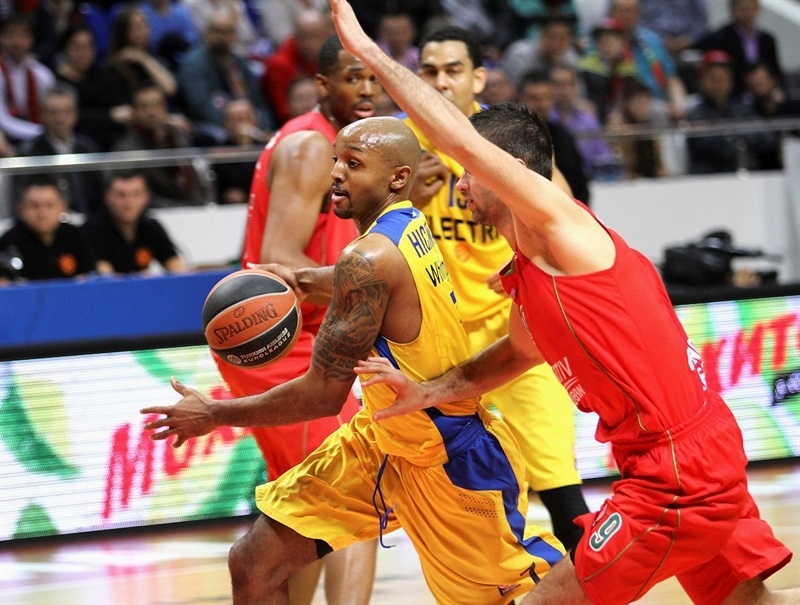 Maccabi slipped to 6-3, but remains in sole possession of third place in the group. The hosts used a 10-0 run bridging the first and second quarters to take the lead and never trailed again. Maccabi closed to within a shot multiple times in the fourth quarter and David Blu had a good look at a go-ahead three with less than 10 seconds remaining, but missed. 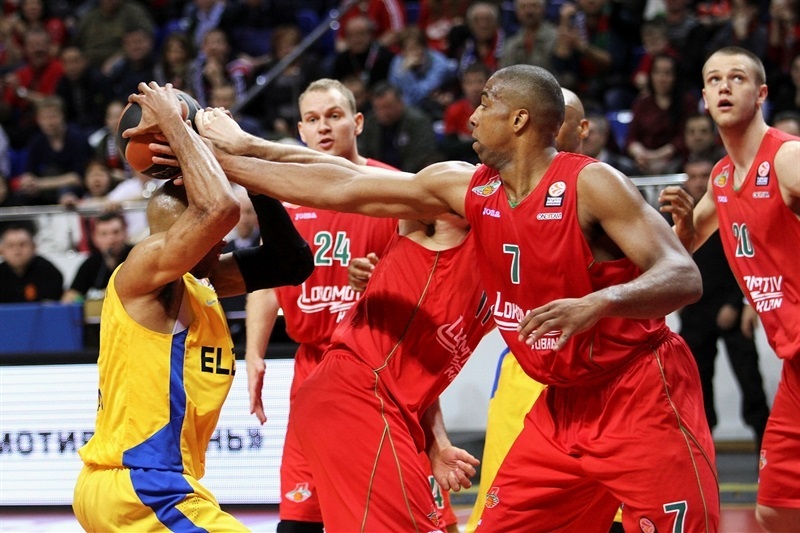 Lokomotiv outrebounded Maccabi 37-26 – including a resounding 12-2 edge on offensive rebounds. 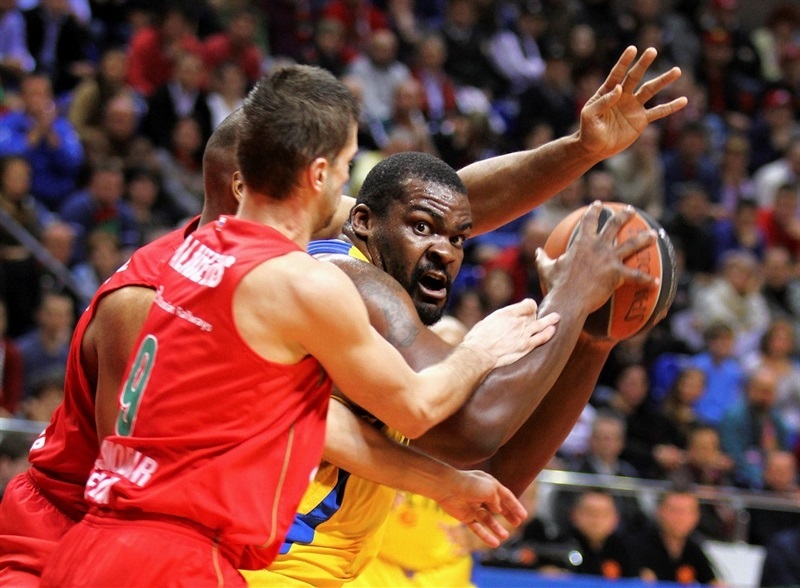 Maccabi was also doomed by 11 missed free throws – most of which came from Sofoklis Schortsanitis, who otherwise dominated inside, but Lokomotiv fouled him at will when possible. Derrick Brown scored 16 points, Mantas Kalnietis netted 10, league-leading three-point marksman Valeriy Likhodey had 9 points on 3 of 3 from downtown and Simon was one of three Lokomotiv players with at least 5 assists. Schortsanitis finished with 18 points on 7-of-8 shooting plus 5 assists, but was just 4 of 11 at the line. David Blu scored 16, Ricky Hickman tallied 16 points and 5 assists, Guy Pnini scored 11 and Joe Ingles totaled 7 points, 6 rebounds and 6 assists in defeat. Maccabi focused on getting the ball to Schortsanitis, who assisted on a Ingles layup to open the scoring and drew a foul on the second possession. Brown buried a long jumper for the hosts’ first basket. Big Sofo scored his first basket, but soon committed his second foul on a Brown basket and found himself on the bench. Without its big man, Maccabi misfired twice from outside, while Kalnietis split free throws and Anton Ponkrashov nailed a jumper to put Lokomotiv ahead 7-4. Pnini connected on the game’s first triple as Maccabi went ahead before Simas Jasaitis tied the score at 9-9. After Ingles drove for a tough layup, Aleks Maric grabbed an offensive rebound, drew a foul and sank both free throws. A splendid Devin Smith rejection of Simon at the rim kept the teams even. Simon came back with a reverse layup that gave Lokomotiv a 15-13 lead through 10 minutes. Marcus Williams buried a three and Simon scored on the break before Likhodey buried an open three from the corner to put Lokomotiv up 10 just two minutes into the quarter. After a Maccabi timeout, Blu’s mid0range jumper marked the visitors’ first basket in six minutes and stopped Lokomotiv’s run at 10-0. 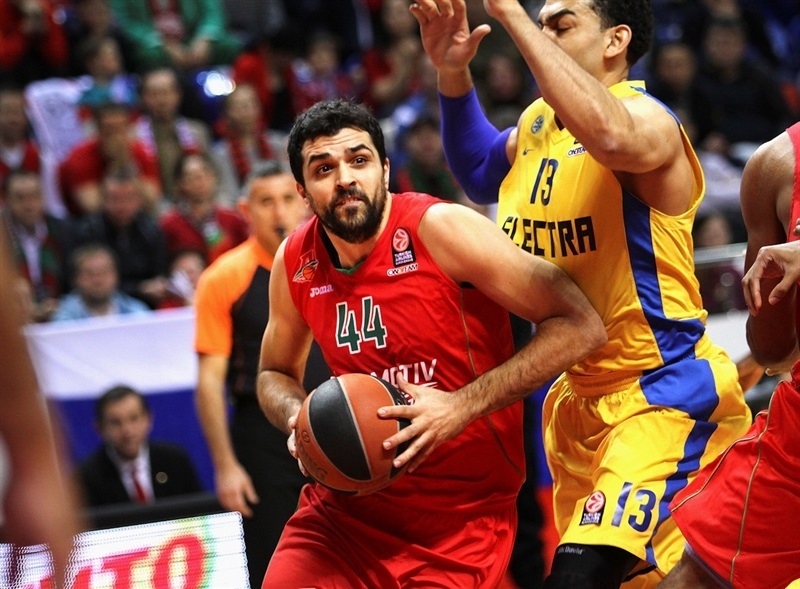 Blu soon added a three, but Maric kept Lokomotiv strong with a basket on the offensive glass. Simon fed Maric for a slam to make it 27-20 midway through the quarter. However Schortsanitis countered with a basket-plus-foul. 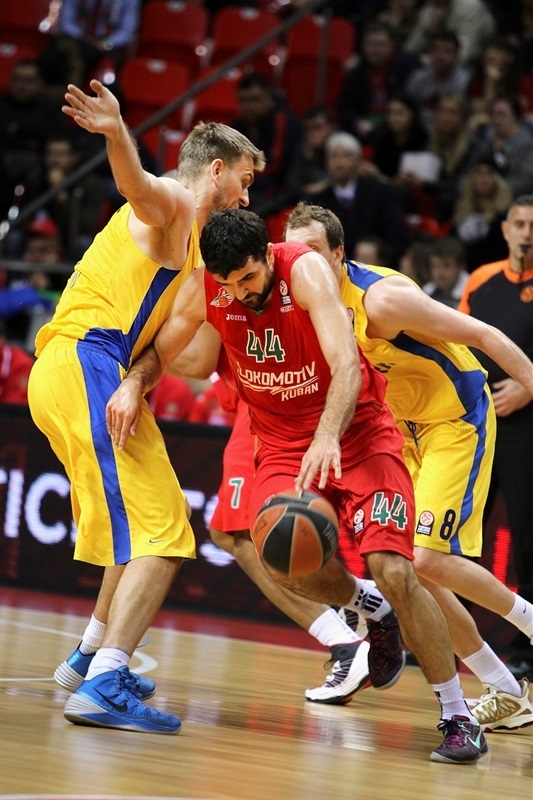 Likhodey and Blu traded threes before Kalnietis scored his first basket for the home side. Richard Hendrix scored inside before Pnini dropped in a floater. Brown saw his jumper fall in after several bounces on the rim to make it 36-28. Kalnietis exploited a blown defensive assignment by Maccabi to sink an uncontested layup for a 38-29 halftime advantage. 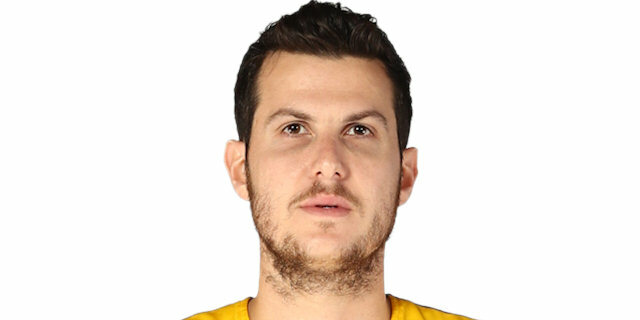 Two baskets and two fouls drawn – including Maric’s fourth – by Schortsanitis led to the first 5 points of the seconds half. Ingles took a rebound and went coast to coast for a layup to close the gap to 2. Kalnietis split free throws for Lokomotiv’s first point of the quarter after some three and a half minutes. Hendrix stole the ball from Ingles and fed Brown for a slam. The big man followed with a block and a slam to restore a 7-point cushion. Pnini countered with a three to make it 43-39 midway through the quarter. Simon dished to Brown for a slam. After a timeout, Smith scored inside, but Simon banked in a shot at the other end. A Blu triple made it a 3-point game. But Simon intercepted a Tyrese Rice pass and Brown converted a missed layup into a slam. Big Sofo drew 2 more fouls, but made only 2 of 4 free throws. Simon and Rice traded drives to the basket before Brown settled the score at 53-48. Blu drilled a three, but Simon answered. Kalnietis scored on a broken play and Maccabi lost the ball on a 5-second violation. Simon’s layup made it 59-51. Hickman drew three fouls over the course of one minute and converted 2 free throws before making a layup to close the gap to 4. 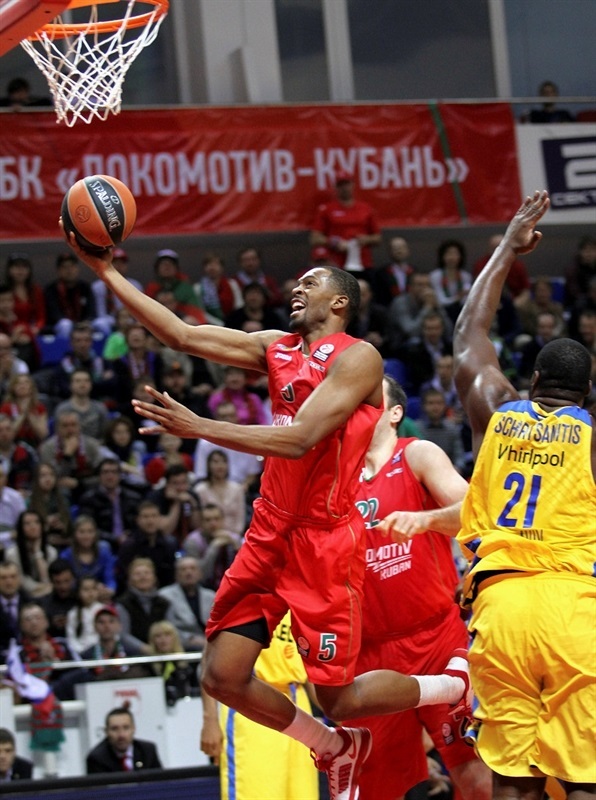 Schortsanitis spun past Maric, scored and sent the Lokomotiv center to the bench with his fifth foul. 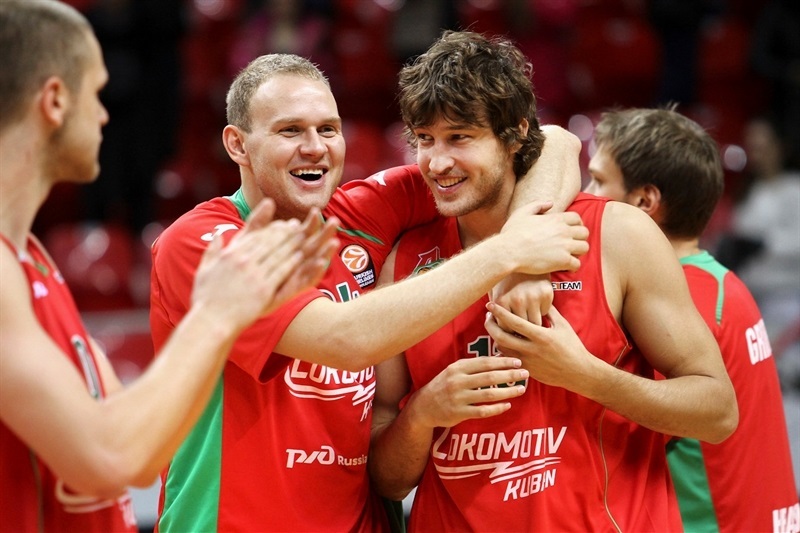 Likhodey buried a three from the elbow to give Lokomotiv some extra breathing room at 63-57. Sofo fed Pnini for a bucket and Smith drove the lane to make it a 2-point game. Hendrix countered with a jumper and rejected Schortsanitis, but Sofo grabbed the ball, bowled Hendrix over and scored to make it 65-63. Soon Hickman carried Maccabi within1 with a triple. Hickman and Pnini used a tough foul to stop Hendrix from scoring, but Kalnietis came in and made the resulting free throws. Simon extended the difference to 71-66 from the line. Hickman drove for a layup and foul – Hendrix’s fourth. Simon drew Sofo’s fourth foul at the other end and sank free throws to make it a two-possession lead. Simon bettered a Schortsanitis basket with a triple. Blu and Simon traded free throws to make it 78-73 with 100 seconds to play. Hickman scored – through goaltending – on the break. Hendrix fouled out going for a loose ball and Ingles made it a 2-point game with 38 seconds remaining. 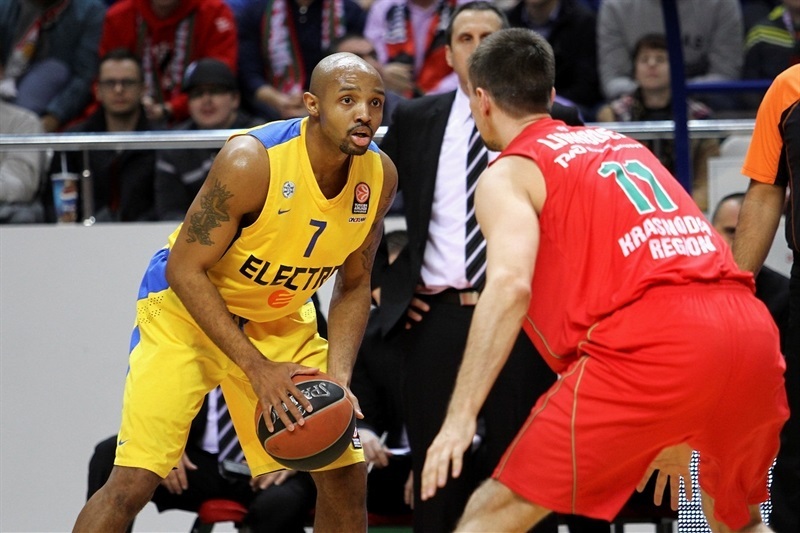 A Hickman steal gave Maccabi a shot at the lead, but Blu missed a three and Lokomotiv held on for the victory. "Congratulations to everyone for this long-awaited win. It's a historic victory for the club, our first against legendary Maccabi. I think from the start of the game we executed our plan of containing Sofo; Maric did a good job on him. And even though Sofo had his 18 points, he didn't dominate like in previous games. We understood that we have to choose – either double him or foul and let him try his luck from the line. The game shows that our plan worked. Other than that, we were able to show good defense and limit our opponent to 29 points in the first half, and in the second our guards were successful penetrating Maccabi’s defense. " "I want to congratulate Coach Pashutin, his staff and the whole club. It was a very tough game for both teams and it could have gone both ways in the final minutes, though Lokomotiv mostly controlled it for four quarters. 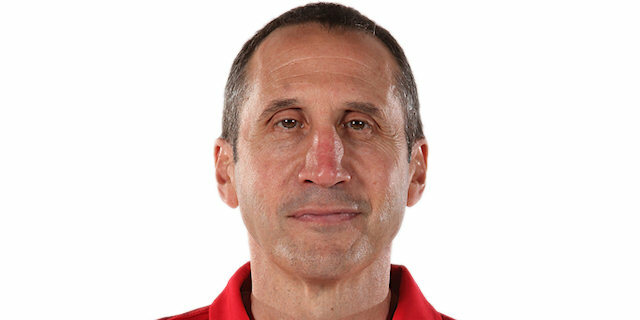 In games that are decided by 1 or 2 points, everyone looks at the end, but as a coach I need to look at the beginning and at the middle of the game, where we could've done a better job. We missed 11 free throws – it's a killer in a game like this. Sofo had good game again, but wasn't lucky enough from the line. " " Before the game I said there's no way we can go 0-4 against Maccabi and we proved our quality today. I'm happy for my teammates, after a long stretch we've finally managed to succeed in a close game. Everyone's saying I had a good game, but it was truly a team effort and a very important one for our playoff chances. " "It was a hard fought game, Lokomotiv did a good job down the stretch of making difficult shots, while we allowed ourselves too many mistakes. "